Phil Spencer is executive vice president, Gaming at Microsoft. In this role, Spencer is accountable for leading Microsoft’s gaming business across all devices and services. With his team and game development partners, Spencer continues to push the boundaries of creativity, technical innovation and fun across gaming genres, audiences and devices. Spencer is both a passionate gamer and seasoned gaming executive serving more than 15 years in the gaming industry leading global business, creative and engineering teams. 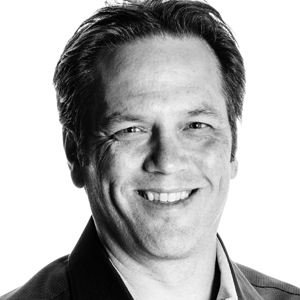 Spencer has held various roles across Microsoft including Head of Xbox, Corporate Vice President, Microsoft Studios, and GM, Microsoft Game Studios EMEA. In these roles, Spencer led the Xbox organization with the launches of Xbox One S and Xbox One X, the acquisition of Minecraft and influenced blockbuster game franchises from “Halo,” “Gears of War,” “Forza Motorsport,” as well as Microsoft Publishing. He’s also led the expansion of cross-platform gaming with Xbox Live, which now counts more than 50 million monthly active users. Before beginning his career as an intern with Microsoft in 1988, Spencer earned his bachelor’s degree from the University of Washington. He currently serves on the board of Entertainment Software Association and of First Tee of Greater Seattle. Spencer has two daughters in college and lives with his wife in the Seattle area.